Cherry Hill East field hockey’s first round game against Washington Township High School has been postponed to Wednesday. Cherry Hill West’s Shannon Meloche lifts the ball over a defender’s stick during Monday’s game between the Lions and Timber Creek Regional High School. 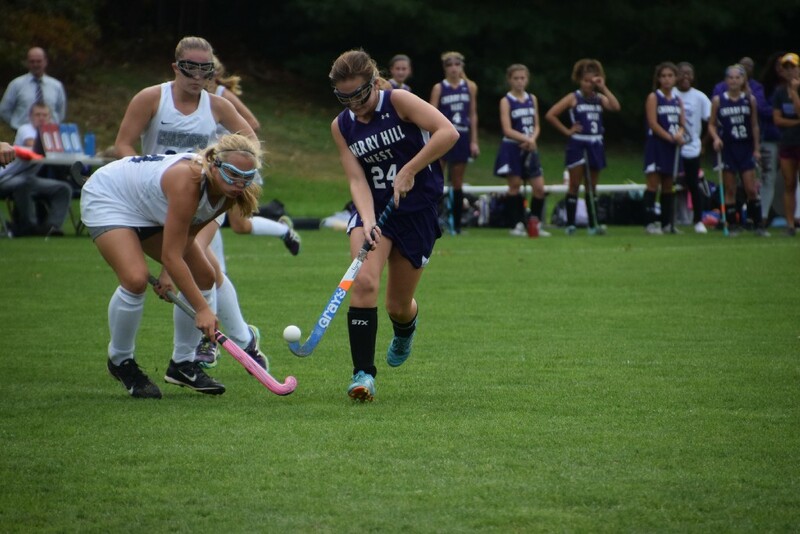 Cherry Hill High School West field hockey fell in its first round playoff game on Monday afternoon at Timber Creek Regional High School. The Lions lost to the Chargers, 3–0, eliminating them from the South Jersey Group III playoffs. Cherry Hill West kept the game tight in the first half, getting a couple scoring chances in the Timber Creek end. However, the Lions failed to capitalize and trailed, 1–0, at halftime. The Chargers got goals from Kristin Eller and Alyssa Shawver in the second half to clinch the win for Timber Creek. Cherry Hill West fell to 2–15 with the playoff loss. They will host crosstown rival Cherry Hill High School East on Thursday night at 5:15 p.m. on the turf in the team’s final scheduled home game of the season. Cherry Hill East field hockey will have to wait an additional day to get their playoffs started. The Cougars first round match at Washington Township High School, schedule to be played this afternoon, has been postponed after heavy rain fell in the area this morning. Cherry Hill East will now play at Washington Township on Wednesday at 3 p.m.